Usually even when I try to plan something like this it never works out. There was a thunderstorm in the morning which made the water stained and muddy. Still managed to catch one of my favorite species, a white bass. 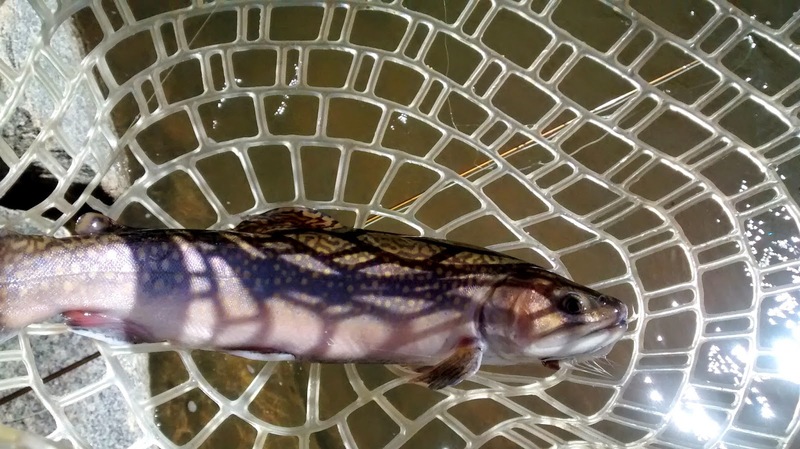 I went to the mountains later in the day and tried a trout stream I'm familiar with. 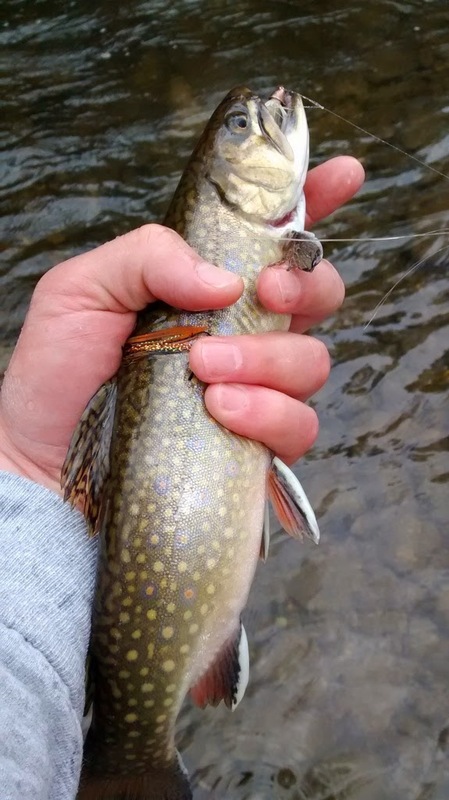 I forgot to pack my trout flies so all I had was streamers. The white wooly buggers saved me from a skunk again. This is has been the strangest spring. We get one day that's really warm then a week of 20 degree colder temperatures. The fish seem to be confused. 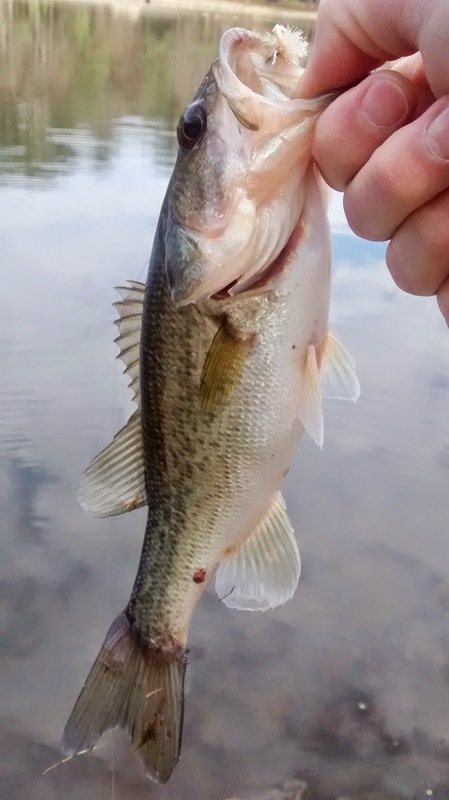 Yesterday at a local pond there were a ton of bass warming themselves on the flats. It was frustrating to see 10 bass schooled near shore that wouldn't hit anything. Many would swim away as soon as my fly hit the water. 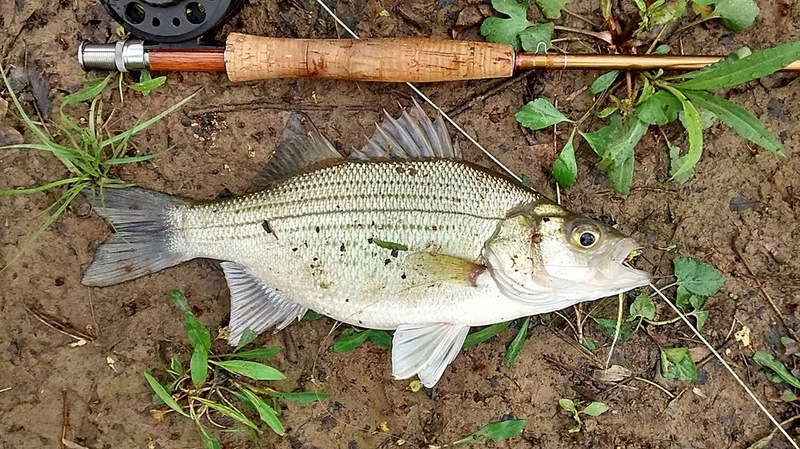 I was able to pick up one bass from a school that was cruising. I think if we can just get a few days in the 70's the fishing will be amazing. My family is taking a vacation in Florida this summer. I've been researching quite a bit about fishing there and there's one bait you see commonly referenced. 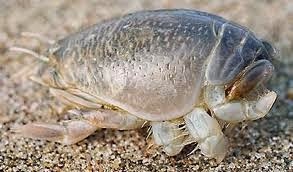 Sand fleas, also called mole crabs or sand crabs. Apparently this is the preferred bait for most fish. In my research there doesn't seem to be a standard all around mole crab fly. This is what the actual crab looks like from the bottom. 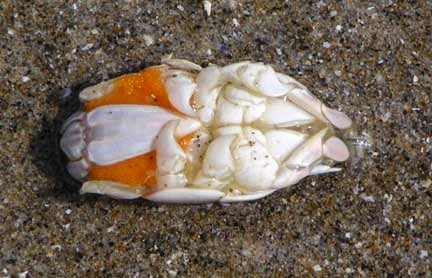 The orange under the body is eggs. I'm guessing this is a trigger for the fish so I tried to add that in all of the versions I tied. This is what the crab looks like from the top. I wasn't sure how important getting a shell like back would be. 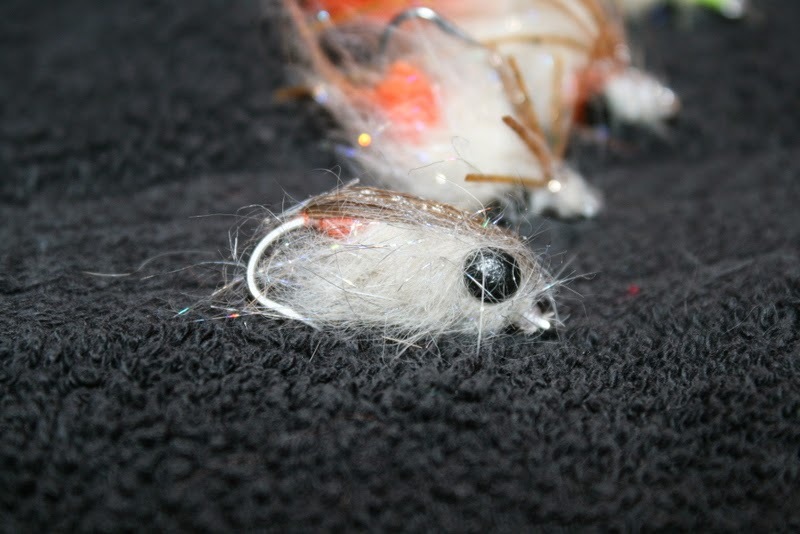 I decided to try making it with bucktail and Clear Cure Goo Flex. I'm happy with how it turned out but in my experience sometimes you spend unnecessary time trying to make a fly too life like. My favorite part is the dubbing. It is made by Darkwater Dubbing and already has a nice blend of flash mixed in. 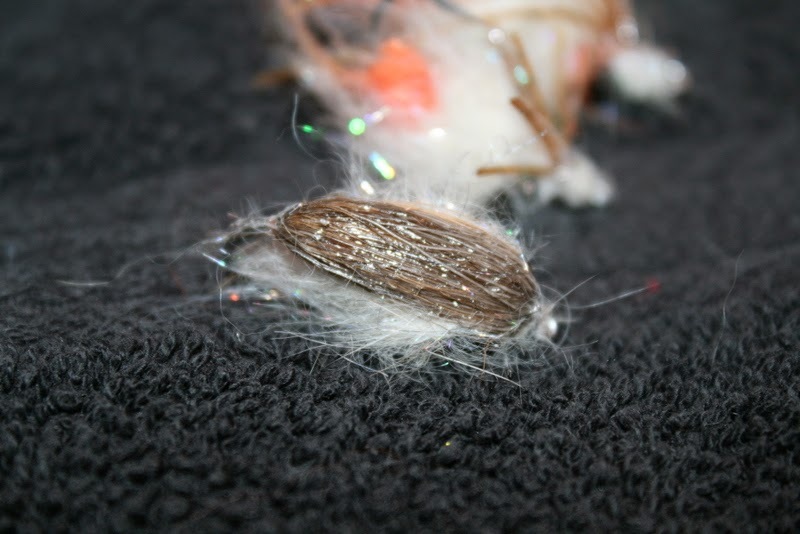 I used it in all of the flies then I tied some orange rabbit strip for the egg sack. It's probably going to take a little time to get the fly to sink until the materials are waterlogged. The dumbbell eyes will help. These are pretty fun patterns to tie and I can't wait to see how they work out. My main reluctance with trying out Clear Cure Goo was the price. The kit is around $50 and I just couldn't justify spending that much for something I wasn't sure I'd like. I ran across a forum thread about people in the same boat I was. The thread pointed out that you could get a whole setup similar to the kit for around $25. The key is the UV curing light. I thought CCG required a special UV flash light but it turns out you can use just any old UV light that's similar. I found one on Amazon for $7 then bought both the flex and thick Goo for $11 each. I'm glad I watched this video first before attempting to use CCG. It saved me from wasting it. There are a ton of videos online showing you different ways to manipulate the goo and tie a infinite number of patterns. I started covering the clousers I had with the goo to get a feel for how the stuff works. The CCG thick really does cure in about 5 seconds. I probably held the light way longer than I needed to just out of fear the fly wasn't cured. The fly had a tacky sticky feel to it after but that can be removed using Sally Hansen's Hard as Nails or rubbing alcohol. You do smell some fumes while the goo is curing. Not sure what kind of brain damage that is causing. 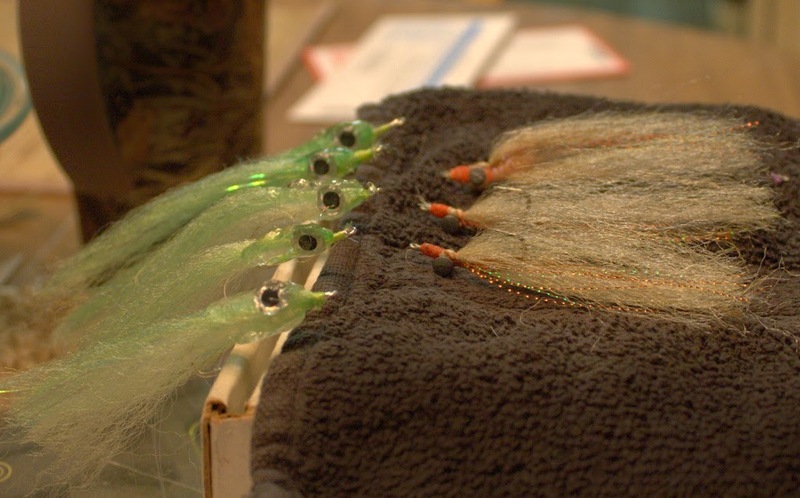 Covering the clouser heads was pretty easy and I have to say they look pretty cool as well. My main goal for getting the goo was to tie some surf candies. I saw a few videos and it looked easy enough. I found right away after doing my first one that it definitely is not as easy as it looks. Especially using the CCG flex. the flex has a different consistency than the thick.The thick comes out like thick maple syrup and the flex comes out like neosporin. You can manipulate the thick by rotating the vise and have the material shape itself. With the flex you have to do more work. I tried manipulating the material with a bodkin and the applicator but it took more time than I liked. Each fly took about 8-10 minutes. 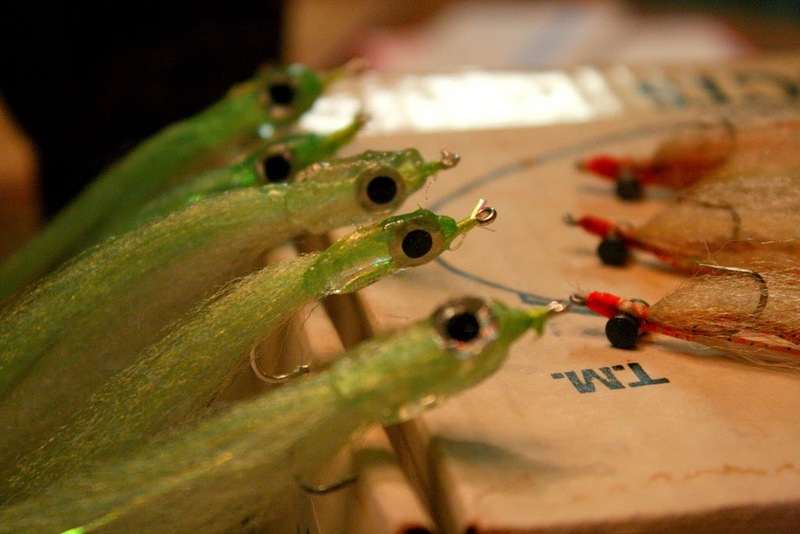 I like how the flies turned out but they look like deformed bait fish. The thing I love about the flex is the feel it gives to the fly. It's a rubber life like feel. The fly is squishy but firm at the same time. I think it really will make fish believe what they have eaten is alive and hold on to the fly longer. The candies were tied using EP 3D fibers. That's going to be a whole different blog post. I can't say I'd recommend them with the goo yet or not. I can tell you the stuff is strange and gets all over the place. I tied the foxy clousers on the right with the same stuff. I love how they turned out but I didn't use the goo with them. 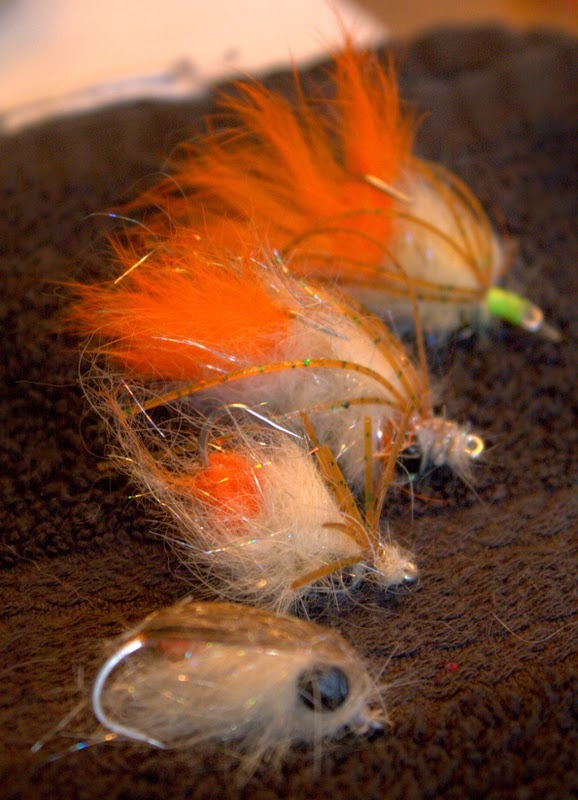 I'm tying all these flies for our family vacation. We're going to Florida and I'm hoping to have a arsenal built up for the surf and bays near where we're staying. I'll try to keep posting what I tie and my experiences with the different materials as I go. I stumbled across this show while surfing youtube. It's more gratuitous over the top fishing but with a little spin on it. There's two teams, one exclusively fly fishes and the other fishes with jerk baits. 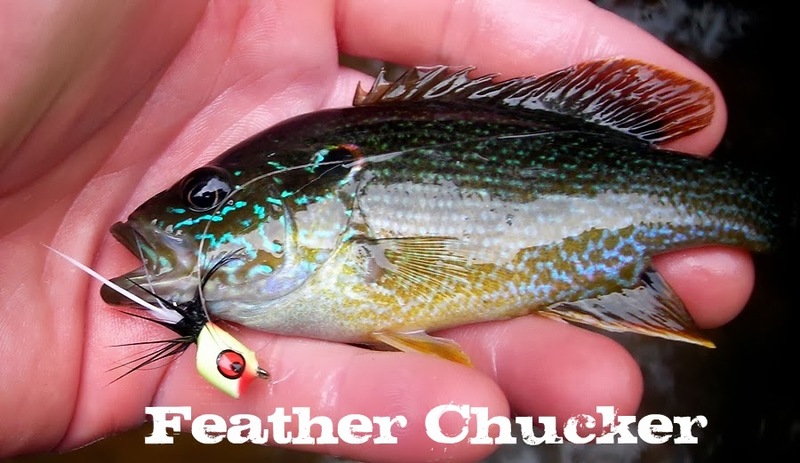 The whole premise of the show is that this is a contest to see which method is more effective at catching not only good numbers of pike but big pike. In the end do we really think this competition means anything? Most likely not but I love the fishing footage and it is neat how they showcase the gear they are using. The first few episodes have some obvious sponsor promotion shots but there's a good portion of the show that is just straight up fishing. I just watched this episode last night and it was pretty good. Did they really stock? The water looked high but you couldn't see any fish where you normally can after a stocking. The water was high and had a slight stain to it. That still didn't give an excuse to why no fish were seen. I tried to start with a two nymph setup that usually always does the trick. I didn't get a bump or see any signs of life. The current was swift and the water seemed cold but I could tell something else was off. I worked spot after spot and started doing things to just see if I could get a follow or see a flash. I eventually was able to entice a fish into hitting. It was a place where the fish usually stack up after being stocked. The fish was rather ugly even with stocked fish standards. The fish looked new though. The situation was puzzling. I decided to try a unfamiliar spot altogether and the scenarios were the same. No signs of life anywhere in the water. I came to a pool where my buddies were fishing. Both were standing on either side of the location giving away the obvious signal that someone caught something. "The fish are deep" one yelled. The spot they were fishing was a pool about 10ft deep. The only action they got was from dredging the bottom. It took almost all the weight they had to get the fly down far enough. I honestly can't stand fishing like that. Not only is it a pain to cast it just seems lame to fish that way. I refused to do it and kept in denial about that being the only way to catch fish. 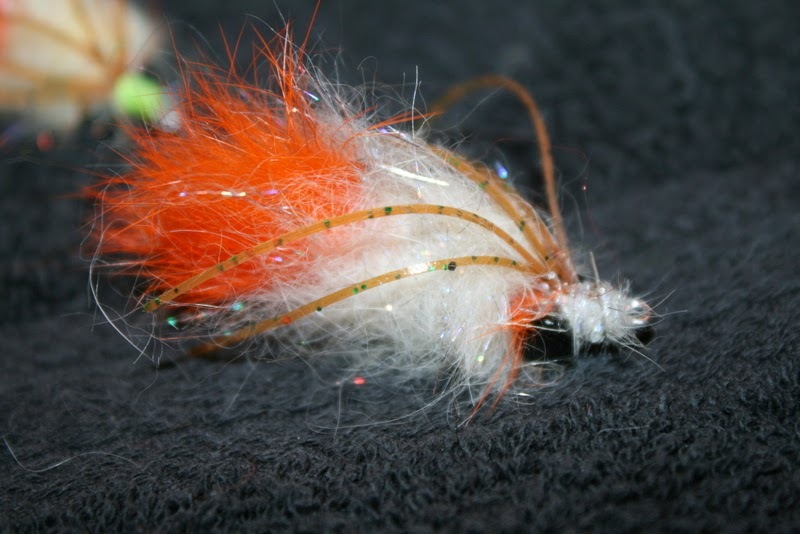 I stuck with streamers, then heavy nymphs and finally with all the strength I could muster I put on some split shot. I definitely had more hits and tugs on my line than I had before but it didn't make me happy. Fishing with a ton of weight is just not fun. I guess I'd rather fish the way I want and not catch fish than fish another way and catch a ton. I met Abbi at the fly fishing show. She convinced me to buy some tungsten stonefly heads. I had no idea she was starting her own viral thing. Just saw this video today. She's like this in person too. Obviously fun to be around. It's nice to see some NC folks getting some love.